Do You Abuse Your Feet? Women account for nearly 90 percent of all operations performed to correct common foot disorders such as bunions, hammertoes and neuromas . The shoes women wear are probably the biggest culprits, especially dress shoes, which are typically characterized by a tight fit, narrow toe boxes, high heels and shapes that don't conform to the foot. On average, women squeeze into shoes that are two and a half sizes too small for their feet. If you're a woman, you can test that yourself: Take off one shoe and place it on the floor alongside your foot. Chances are your foot will be wider than the shoe. To keep their shoes on, women who wear narrow-toed shoes, a popular fashion item, must squeeze the forefoot tightly, placing considerable pressure on the big and little toes and all the bones in between. If the shoes also have high heels, the pressure on the forefoot soars by a factor of five. As a result, the forefoot is literally molded into an abnormal shape. Bunions are among the most common problems caused by wearing tight or ill-fitting shoes. A bunion is a painful bony lump covered by a pad of tender flesh that develops as a result of the body's attempt to cushion the toe from excess pressure or friction. Although many people consider bunions to be simply a cosmetic disorder, the problem is much deeper. The first joint of the big toe is shoved out of alignment, and the end of the foot bone just behind it juts out. A tendency toward bunions may be inherited, since they often run in families. But research has shown that shoes are mainly to blame. Hammertoes usually accompany bunions . 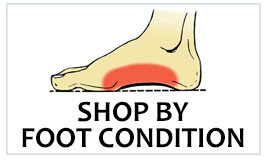 The condition develops when a toe becomes fixed in a crooked position. Ultimately, the end of the toe faces permanently downward, like the head of a hammer. The second and third toes are particularly prone to the condition because they're longer and apt to get shoved backward as a result of the limited toe room in tight shoes. Hammertoes can be painful and, when severe, may impede walking. In addition, thick calluses or corns often develop on the tops of the affected toes. Neuromas , benign swelling of a nerve in the foot, can also be aggravated by tight or ill-fitting shoes. The continual pressure squeezes the bones of the foot together until they impinge on the neuroma, usually between the third and fourth toes but sometimes between the second and third. The rubbing of the nerve against the bone causes significant irritation, and the entire lower foot may eventually become numb or develop a burning or tingling sensation. A change of shoes is often all it takes to alleviate foot problem. Roomy, comfortable shoes, such as running shoes, should be your first step. To get the proper fit, many women may have to resort to wearing men's athletic shoes. Once you've worn roomier shoes for a few weeks you may be unable to squeeze back into your dress shoes. Comfort or fashion, you decide. In some cases, a bit of felt or foam padding placed in the sensitive area of (roomier) shoes helps relieve discomfort. Painful neuromas sometimes require corticosteroid injections to reduce inflammation. The last resort for treating any of these foot disorders is surgery, which involves realigning the crooked toe bones in the case of bunions and hammertoes or removing the damaged nerve itself in the case of neuromas . Foot surgery is not a minor procedure, and it's not entirely risk-free. There's always the chance of complications developing or of the condition being made worse. Although most surgical corrections of bunions and hammertoes are successful, these conditions will recur in about 10 percent of cases. Women who develop bunions or hammertoes early in life (in their 20s, for example) may be "ligamentously lax" � that is, the connective tissue in their feet is easily stretched out of shape. For these women, the risk of postsurgical relapse is considerably higher. Surgical correction of a neuromas should be performed only when necessary because it will result in permanent numbness in the part of the foot that's served by the nerve. Fortunately, women today are increasingly resisting the urge to crush their feet in the pursuit of fashion. The trend is due in part to changing fashions and in part to less rigid dress codes in the professional world. There are now many more options for women who want to dress professionally and be kind to their feet.